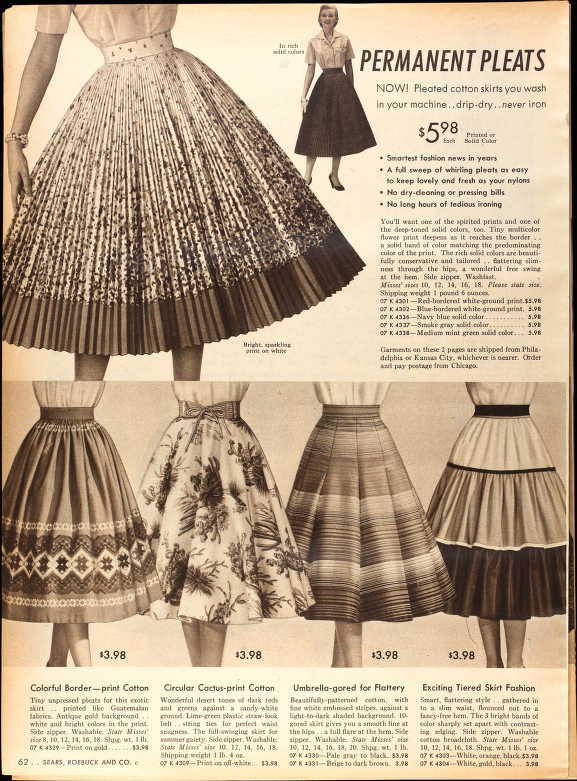 Here are some more lovely catalogue scans, this time of skirts from 1955. 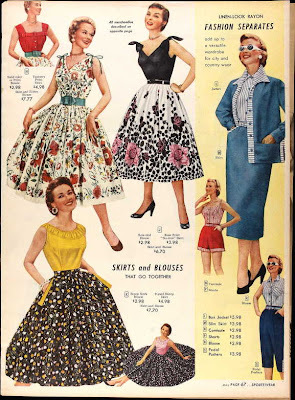 I love the small flower one below (also the plaid dress)! I'm a sucker for big, full, box-pleated skirts myself. The yellow is pretty. 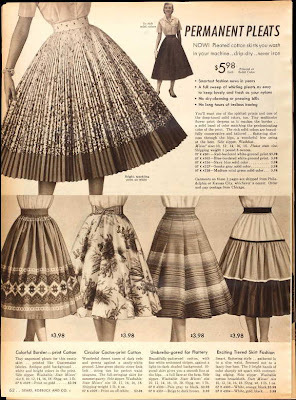 I couldn't possibly choose just one favourite when there are that many beautiful skirts. I love the permanent pleat skirt, and the navy and pink floral border skirt. I was just thinking of making another full skirt. 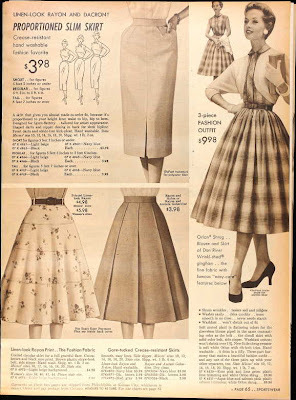 Indeed, 50s fashion is wonderful, I think that clothing is the time with more color and fun. I like the dress above your yellow one with the turquoise belt - I would love to have that in my wardrobe for summer! Gosh the prints just kill me, they're always so awesome. I love that white skirt with the black leaves and bright splashes of large pink flowers. 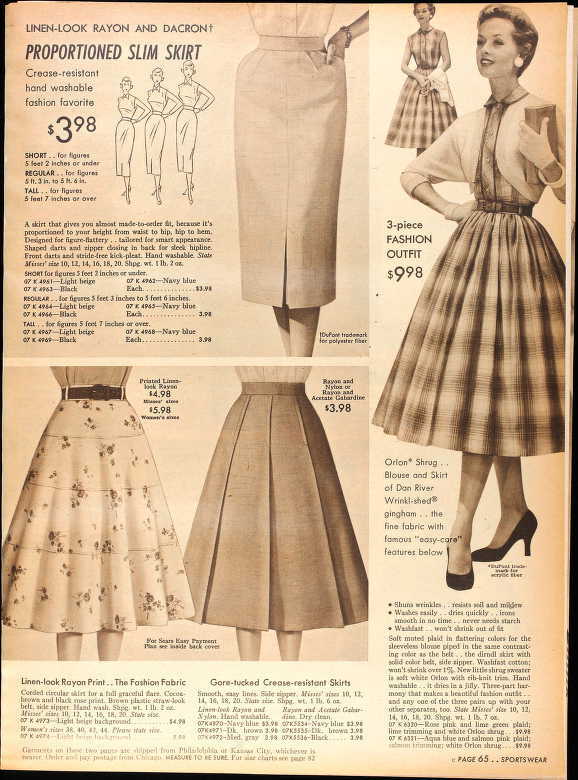 Though I do love the add for the "proportioned slim skirt". And only $3.98...! Those are so beautiful, they make me want spring to arrive even faster! I do love the yellow one. The heavily pleated one in the middle is beautiful too! I wonder how much fabric that one took! It's the plaid for me, through and through. Wow, that pleated one is amazing. Makes me think of all the places I can get some fabric pleated...lol. :D Great scans! Just found you blog by way of a search on 1950's... 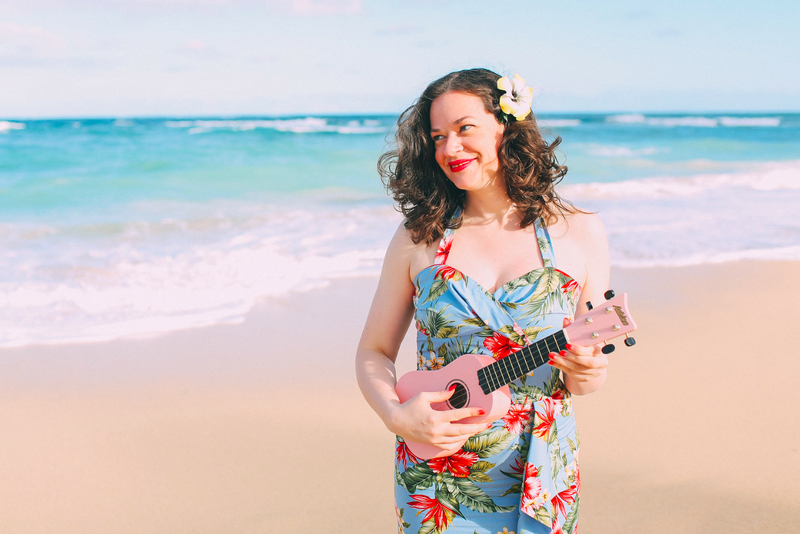 I love your post, and I am off to my sewing machine! Love the black flowers and black top one.